“Percy Jackson: sea of monsters” is the second installment in the Percy Jackson and the Olympians series based on the young adult series of books of the same name. The first movie “Percy Jackson & the Lightning Thief “came out during 2010 and did lukewarm business for Fox. So, getting a sequel was never given even though there was a dedicated fan base for the books. But, Fox’s need for a successful franchise gave Percy and company a second chance. Did it pay off? Well… It’s better than the first movie. The books and the movies follow Percy Jackson and company who are half human, half Olympian god teenagers go on adventures or “quests” in each installment. 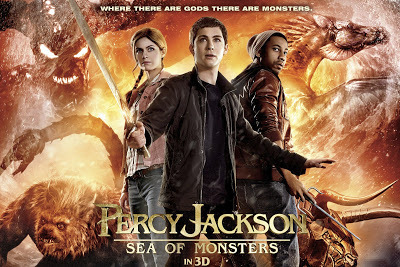 In “Percy Jackson: sea of monsters”, Percy Jackson and company venture to the Bermuda triangle or “sea of monsters” to find the Golden Fleece although there are no explanation why a mystical Greek item ended up in the Americas is never explained. But in this world, the entrance to Olympus is on top of the Empire state building. So, if you cannot give this a pass, you’ll have a hard time with this movie. The first Percy Jackson movie had 3 major problems. First, it was a blatant copy of the Harry Potter movie series. Part of this comes from the source material. In the young adult literature medium, blatant rip-offs of common as Star wars clones. It is evident that the Percy Jackson books were riding the coat tails of the Potter phenomena. It had Percy Jackson and friends triad standing in the Harry, Ron, and Hermione triad playing almost the same rolls. 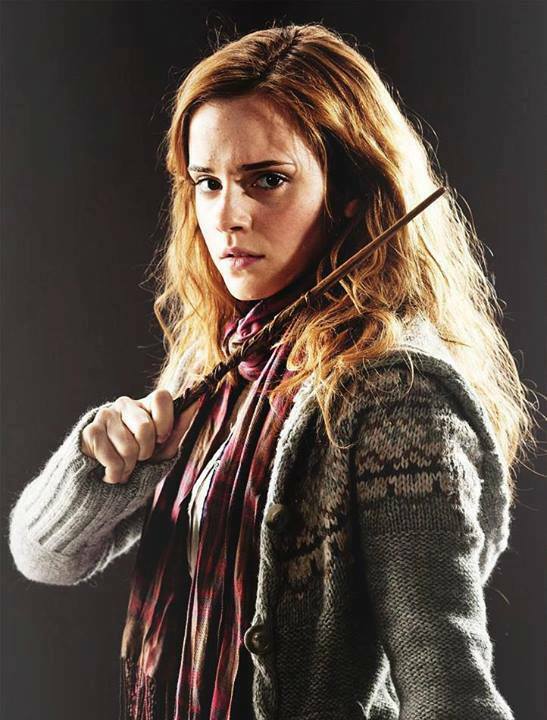 To differentiate itself, the books targeted a much younger audience than the Harry Potter series and replaced the Victorian/British elements with Greek mythology. However, this was not enough to erase the taste of being derivative especially in the movie. The movie watered down the little uniqueness that the source material had and the only thing left was the Harry Potter clone. 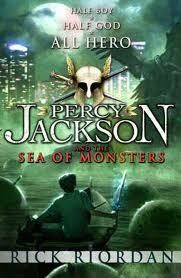 “Percy Jackson: sea of monsters” cannot avoid being derivative but does bring something new to the equation. For a considerable part of the movie, the whole Greek mythology things is put more towards the back and the movie feels more like a junior Bond movie. You have a Bond villain on a posh yacht with his Hench men delivering monologues and leaving the hero open to escape and ruin his plans. Percy Jackson is getting into hand to hand combat, shooting guns, and using gadgets to get out of tough situations. While this itself is not new, it’s new to the series and actually works compared to the Greek mythology elements which does not. Second, the first Percy Jackson movie copied the wrong Harry Potter movie. The Percy Jackson book series targeted a much younger audience and stayed with that audience throughout its run compared to the Harry Potter series which tried to grow with its audience. If the book series copied the early Harry Potter books, the first Percy Jackson movie copied the latter Harry Potter movies. The characters were set older than their book counterparts and the actors were cast much older with the triad being in their late 20s except for Logan Lerman who was in his late teens. An older audience means that they require more sophistication than a kid audience. The problem is that the world of Percy Jackson is paper thin. The Greek mythology is awkwardly fit into the book’s world and the scope of the adventures was very narrow. As an adult reading the books, you cannot avoid the fact that, while they have their own charms, the books are very juvenile. The Percy Jackson movie did nothing to flesh out the world and actually did the opposite by simplifying the world even more. Thus, the world is not convincing enough on its own terms and the plot does not help. Percy Jackson who is kid with a very narrow scoped perceptual world view is thrust into circumstances with global scope. The problem is not with Percy Jackson’s perceptual world view as he is a kid. The problem is not that he is thrust into circumstances with global scope. It happens. The problem is that Percy Jackson and company are the only active entities in these circumstances. The Gods are passive entities doing nothing. As a 9 years old kids fantasy, this is ok. But, for a more mature audience, it is just stupid. This does not change with “Percy Jackson: sea of monsters”. It is even worse since the gods are almost absent through the whole movie. However, it does work with the junior James Bond thing going on. Finally, the roles in the Percy Jackson movie were miscast. Logan Lerman, while being a decent actor, does not have the screen presence to carry a hero role. This could be said the ba also true with Daniel Radcliffe in the Harry Potter movies. However, Daniel Radcliffe at least is interesting to see on screen and worked well within the Harry, Ron, and Hermione triad. Harry worked because of the triad. While Percy Jackson has his own triad, they did not have chemistry. Brandon T. Jackson, as the comic relief, was just ok with the other members and Logan Lerman and Alexandra Daddario had zero chemistry. Alexandra Daddario was not a great actor at the time and it was unclear other than being the girl in the triad what her relationship was with Percy Jackson. It did not help that there was more than 6 years difference between Logan Lerman and the other characters and the other 2 had play characters more than 10 years junior tot their actual ages. 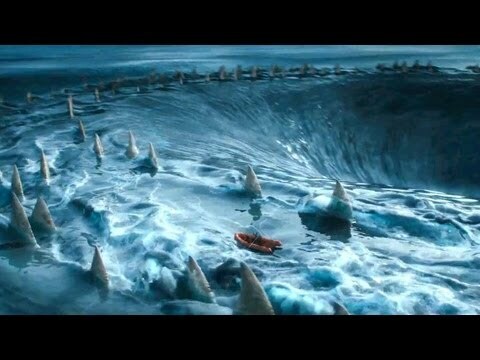 Not much has changed in “Percy Jackson: sea of monsters”. Logan Lerman and Alexandra Daddario still have zero chemistry. It actually has gotten worse as Alexandra Daddario who is 27 seems to be taller than Logan Lerman. In Hollywood, you cannot have a male lead that is shorter than the female lead. 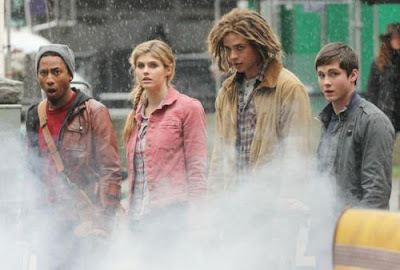 So, “Percy Jackson: sea of monsters” tried to pull off a Tom Cruise. It is evident that there were tricks employed to make the two seem to be a similar height and Alexandra Daddario is constantly slouching. 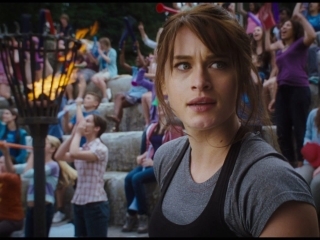 One good thing with the casting in this movie is bringing in Leven Rambin who is only 2 years older than Logan Lerman. The two had a lot of chemistry and it was sad that she did not get much to do in the movie. Overall, “Percy Jackson: sea of monsters” is a so so movie that it would be a bad choice catching it on cable one night as it feels like a decent cable movie for a youth oriented channel.